I realized recently that almost all my favorite fantasy books have a certain sense of wonder about them. There are usually some dark events taking place in literary fantasy worlds, which of course is necessary to create a plot with conflict and tension. But in the midst of that darkness, the books that can instill awe and wonder as I read are the ones that tend to stick with me. So I wanted to share a bit about what those books have in common. Maybe it's the logical side of my brain taking over or the fact that I'm a bit of a math nerd, but there's something so satisfying about a fantasy world that makes sense. 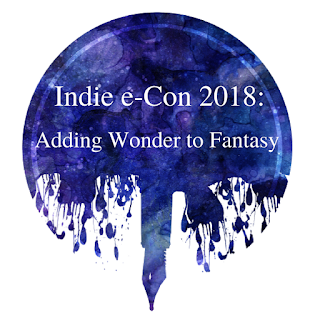 Whether it's magic, fantasy creatures, strange powers, an unearthly setting, or some combination of the above, readers can tell the difference between world-building where cool elements are thrown in haphazardly versus a carefully laid out system with depth and intricacy. Creating a structure that will wow such readers not only involves planning and consistency, but most importantly requires dropping hints and tidbits of information that build the world layer by layer, leading to "Aha!" moments where the pieces suddenly fit together. The book I'm reading currently, Halayda by Sarah Delena White, illustrates this really well (at least so far!). As the characters travel further into the faerie world and delve deeper into the mystery of how to heal it, the history and magic come together to reveal more and more of the fae's secrets, making me eager to learn more. Usually there needs to be something going wrong in a fantasy world, or there won't be much of a story. But a darkness that's too pervasive gets depressing and snuffs out the reader's feeling of wonder when exploring a new setting. Hints of light can come from humor, characters striving to achieve some good in their dismal surroundings, help from unexpected sources, or glimpses into the former and/or future beauty the world could hold. In The Story Peddler by Lindsay A. Franklin, the characters are suffering under the rule of a corrupt, greedy king. Fear and poverty prevail, yet even at its darkest moments the world holds a sense of beauty through new friendships, courageous acts of love, and the incredible sculptures built by the threads of the story weavers. Definitely a world I wanted to spend more time in! Exploring an intriguing fantasy world alone is fine, but getting to explore with characters you relate to and love makes the experience so much more enjoyable. No matter how interesting or beautiful the fantasy world an author has developed, readers won't become attached unless they care about its inhabitants. Trying to imagine the Harry Potter series without Harry, Ron, and Hermione, the Chronicles of Narnia without Peter, Susan, Edmund, and Lucy, or the Lord of the Rings trilogy without Frodo and Samwise is practically inconceivable, because our experiences of those stories and fantasy worlds are so closely tied to their central characters. As important as it is to create a vivid, intriguing fantasy world for readers to visit, it is even more essential to develop complex, relatable characters to give readers perspective, insight, and an emotional tie to the story. What aspects of a book produce a sense of wonder for you? Can you recommend any books that accomplish this well? Great tips! I think that the light-in-the-darkness element is especially important; for me, that's often what elevates a story from good to truly great.